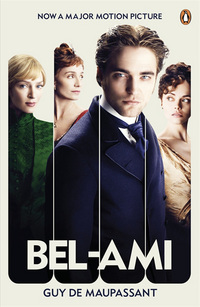 So here we are at the readers’ group discussing Bel Ami. But there’s only two of us and one of us hasn’t read it. Not a good start! Other ladies are only too keen to ‘help him out’ financially and he is not averse to bewitching a string of beautiful women to become upwardly mobile. Without giving away too much of the story, obsession is the word to use for the feelings his boss’s wife has for him. This entry was posted in Book Reviews, Film Tie In and tagged Bel-Ami, Book Reviews, Guy De Maupassant. Bookmark the permalink.